- Publisher Passionate loveKilling and revengeTragedy, tyrants, tearsPraise, prophecy, peace!Here's your All-Access Pass to backstage buzz, inside info, and a feeling like you're watching the show from the wings instead of way back in the balcony! But...the world's best-selling book is also the world's least understood book. Especially the Old Testament! Emphasis on ... 'old' ? As in, 'What does that have to do with me?' and 'Didn't Jesus, like, do away with all that stuff about God-of-vengeance and flowery love poems and obscure prophecies?' Thanks for asking.Here's the secret: God's Word is God's Word. Jesus not only quoted Old Testament scripture, he fulfilled it. You can't fully know Jesus without knowing the first two-thirds (or so) of the Holy Bible. Thanks for wondering: 'But, um, there's all those begats, and dead kings with names 28 letters long, and...'...and the greatest aid since sliced matzo (all right, it's easier to break than slice) is Backstage Pass to The Bible---Old Testament! It's short and compact...it summarizes the details and highlights the important...it's chock full o' cartoons and fun little charts to make everything clear (and memorable)...and---thanks for figuring this out already---it will give you a hunger for the Old Testament itself, once it all makes sense!Backstage Pass to the Bible---Old Testament will revolutionize your understanding of God! Hey---can knowing how He works in our lives, and wants to work in our lives, ever be bad? You don't have to snake in the stage door...here's a backstage pass, just for you. Rock on! 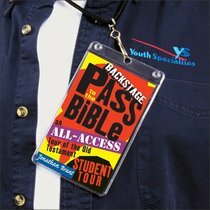 About "Backstage Pass to the Bible: Old Testament (Student Book)"
Passionate loveKilling and revengeTragedy, tyrants, tearsPraise, prophecy, peace!Here's your All-Access Pass to backstage buzz, inside info, and a feeling like you're watching the show from the wings instead of way back in the balcony! But...the world's best-selling book is also the world's least understood book. Especially the Old Testament! Emphasis on ... 'old' ? As in, 'What does that have to do with me?' and 'Didn't Jesus, like, do away with all that stuff about God-of-vengeance and flowery love poems and obscure prophecies?' Thanks for asking.Here's the secret: God's Word is God's Word. Jesus not only quoted Old Testament scripture, he fulfilled it. You can't fully know Jesus without knowing the first two-thirds (or so) of the Holy Bible. Thanks for wondering: 'But, um, there's all those begats, and dead kings with names 28 letters long, and...'...and the greatest aid since sliced matzo (all right, it's easier to break than slice) is Backstage Pass to The Bible---Old Testament! It's short and compact...it summarizes the details and highlights the important...it's chock full o' cartoons and fun little charts to make everything clear (and memorable)...and---thanks for figuring this out already---it will give you a hunger for the Old Testament itself, once it all makes sense!Backstage Pass to the Bible---Old Testament will revolutionize your understanding of God! Hey---can knowing how He works in our lives, and wants to work in our lives, ever be bad? You don't have to snake in the stage door...here's a backstage pass, just for you. Rock on! Jonathan Brant studied theology, youth ministry, and communication in the U.S. and England. After a five-year stint as the youth worker for a London parish, he and his wife accepted the invitation of the Anglican Diocese of Uruguay to develop a strategy and a program for ministry to youth and young adults there.